It’s easy. 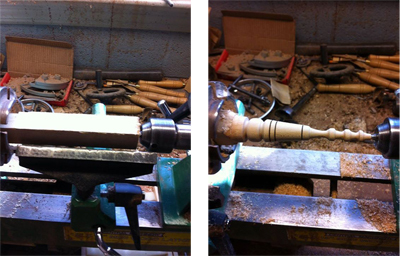 take a hunk of wood and put in on your lathe, several minutes later you have a Christmas ornament. Don’t let anyone know how easy it is. I always wear a full face sheild and never wear loose clothing that could get caught. 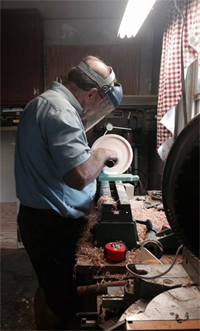 If your lathe vibrates it is telling you that your piece of wood is unbalanced and unsafe. Keep your tools sharp because a dull tool is also unsafe. Most of all have confidence in yourself and enjoy what you are oing. 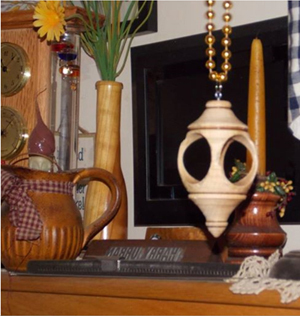 I am so busy with my wood turning and working on our 2015 FMN Cookbook I don’t have time to think about my Alzheimer’s. Our cookbook is up to 235 pages and still growing. I think keeping busy keeps me from thinking of the buggy boos and things that go bump in the night. Between the Memory Cafes I attend, webinars I am involved in and the mentor groups I speak at, plus all the advocating I do with anyone that will listen to me, it is no wonder that I have no time to worry about my dementia. * Admin issues: SHARE dementia awareness thru buttons below. If interested in receiving notice of future blog postings there is a “follow” button in the upper left corner (MS Explorer) or lower right (Safari and Chrome). Feel free to leave your thoughts in the form of comments, but please filter your comments with truthful loving kindness to all concerned. If there is an advertisement below, I have no control over what is shown. — Copyright exclusively by Harry Urban on 2015-10/05 (( but if there is underlining, it is Truthful’s doing in order to easily find quotes in the future )). Tags: crafts, Harry Urban, wood.